At just four years shy of turning a century old, Leopold’s is a Savannah institution. Founded in 1919 by three immigrant brothers, the spot is truly an old-school soda fountain diner, with BLTs and pimento cheese sandwiches sharing menu space with chocolate chip and pistachio ice creams, happily scooped by white hat-wearing workers. 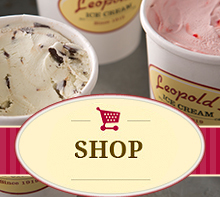 Leopold’s is still in the family and you’re going to want it covering the mouths and faces of your family anytime you’re in the Peach State.